You might have noticed that I haven't posted any Lost Colonies session reports for awhile. This is primarily because I've been fairly busy and the party has been doing virtually the same thing for the last three sessions. Thus, I've waited until now to write it all down. I took (what I thought was) a big risk with my campaign. Dn. Goram was Geased to find and return the Two Swords to the Lost Temple underneath the Monastery of St. Urheim. Ahkmed the Dwarf has a map to some kind of dwarven treasure/lost colony (actually a slightly modified version Mr. Raggi's Hammers of the God). I had also recently bought Realms of Crawling Chaos and was eager to integrate ideas from it into my campaign. As a result, I decided to give Dn. 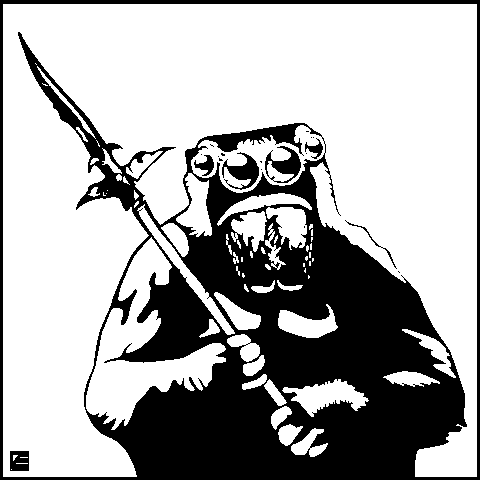 Goram a clue to lead him in the direction of the Dwarves (who live in a mountain range to the southwest of Headwaters) and happily placed elements from RCC and Hammer of the God in the area. The risk: the Two Swords had been placed into another dimension by some monastic dwarves in order to protect them. That other dimension happened to be a spaceship. Thus, the dwarven monastery occupied by white apes and their minions was full of RCC-derived stuff and sat upon the mountain where I placed Hammers of the God. The party succeeded in clearing out the dwarven monastery of its ape-like occupants, fended off an attack by some harpies and their slaves and proceeded to manufacture the formulae that would allow them to dimension hop. This required some uncomfortable ingredients — some of which they were able to find in the monastery, others they had to procure. After quaffing the first dose of the formulae, the party found themselves in a spaceship (though it took awhile for them to realize this, given my method of trying to describe things like plastic and computer screens). When it dawned on my players what I was doing, one gleefully exclaimed "We're playing a little Gamma World today!" Despite my trepidations for so blatantly breaking genre, my players had a terrific time. They encountered a number of slime-like creatures with a variety of special abilities and immunities (and proved to be quite a challenge for the party). The party was quite shocked when one such creature swallowed Dn. Goram whole. Fortunately for him, the four-hour-dimension-hop ended before he was digested. The exploration of the ship required three separate trips. They found a variety of tools and food-stuff that was the equivalent of treasure as well as the remains of the crew that apparently died some time ago in a mysterious manner. In addition, they found a type of prison where a number of strange creatures were being held in stasis (including a shocking number of mind flayers). They found what they believe to be the Two Swords and managed to retrieve them both, but not before messing around with the ship's nuclear reactor. Their actions caused a meltdown which was going to destroy the ship and everyone on it. Fortunately, the party was prepared and cast a Dispel Magic to pull them back into their own dimension before the whole ship went boom. These three sessions ended up being some of the most rewarding I've had during this whole campaign. It combined some of the things I like best about old-school play: exploration driving plot, deadly combat, genre bending locales and player freedom and creativity. My players really enjoyed themselves and wanted to know more about the mystery of the ship and what it was all about. As a result, they decided to find the dwarves and report to them what they found. In process, they discovered that the Dwarves blame one of their own for the fall of the Thassalonian Colonies, of which the appearance of the Golden Masks was a consequence. They warned the party against pursuing Ahkmed's map (much to my own disappointment). The party did some trading and began to establish some economic ties to the Dwarves (who were extremely interested in some of the technology the party brought back with them from the ship). Finally, Ahkmed found out he is now what the dwarven loremasters call a Bane-Bearer. His sword Hornet was forged along with several other weapons. Each is a bane of a specific race. They were created in an attempt to keep peace between the various races; however, an evil dwarf managed to collect them all and wreck havoc upon the races. Since his defeat, these Bane-Weapons had been lost — until now. One final note: when I began doing these session reports, one of the things I was interested in observing was how a bunch of players who came into the hobby with 3.5 would react to old-school rules and play. After 35 sessions I can now report that all of the guys in my group have officially dropped 3.5 in favor of a variety of older rulesets (primarily AD&D and LL). Interestingly, one of them has gone out of his way to buy a bunch of Judges Guild stuff (having been introduced to their existence through my campaign). As he was excitedly reporting to me some of his finds, he exclaimed, "The old stuff is so much better than the new stuff!" To riff off ye auld bard, the play is the thing. Today is the Synaxis of the Archangel Gabriel, where the word Synaxis means gathering. A Synaxis happens the day after a major feast day (yesterday was the Annunciation) and they highlight figures that take part in those major feasts. For example, the day after Epiphany (the baptism of Christ) is the Synaxis of St. John the Baptist. The name Gabriel is often translated as God is mighty or the strength/power of God (where el means God); however, the most literal translation is Man-God. Thus, his name is a prophecy of the Incarnation of Christ (who is perfect God, perfect Man) whose conception Gabriel announces. In Orthodox Christianity, angels are most often referred to as the heavenly bodiless powers and are considered part of the invisible creation, though they are able to manifest as visions and people — the most fantastic of which are the many-eyed Cherubim who wield flaming swords (see Gen 3:24; Eze 10:1; and Rev 4:6). During the liturgy, the faithful petition God "For an angel of peace, a faithful guide, a guardian of our souls and bodies" as well as "the protection of the honorable, bodiless powers of heaven." Thus, one of the easiest ways to include the presence of angels in a Fantasy RPG setting would be to re-skin protection spells and magic items as angelic intervention. For example, Protection from Evil could manifest as a pair of translucent wings that envelop the one being protected. With a little imagination, there are very few spells (Animate Dead being one) from the LL Cleric spell list that cannot easily be re-skinned with some kind of angelic special effect. Detection spells can take the form of whisperings in the ear. Remove Fear can take the form of a shield and sword wielding angel that inspires the recipient out of their fright. Offensive spells could take the effect of an angel striking down their target. This re-skinning also implies a need to closely adhere to the will of God. If a cleric were to use one of his spells to attack a village, for example, it would make perfect sense for the spell to fail. Or, in another example, if a Hold Person spell were taken advantage of to easily kill an opponent, the spell could cease to function in order to give the victim a chance to defend itself. These shields appear as normal round shields emblazoned with the six-winged form of a Seraphim. In combat, they function as a +1 shield; however, if the wielder asks for angelic protection, this +1 may be transferred to any one else the wielder chooses in the form of an AC or saving throw bonus. In addition, every other round, the wielder can negate any hit suffered from someone other than themselves if they forego any attacks for that round. One of my favorite renditions of Swords & Wizardry is Mike Davison's Ruins & Ronin. One of the minor tweaks that I enjoy is the way R&R handles armor and AC. Since the Japanese historically did not make use of the shield in the same way the Europeans did, shields are not part of the game, nor are they there to create a nice, clean AC progression. Rather, R&R allows players to cobble together various armor pieces where a full set of O-yori armor is AC -1. It has more potential for respresenting historic armor types from a wider range of time and place. It conceptually makes more sense with a Weapon vs. AC table than the traditional "+shield" AC progression. It suggests a simple encumbrance rule where AC (modified by STR or DEX) x10 = movement (I must admit, I am borrowing this from something I read in the blogosphere, but I cannot remember who was the originator). It can make helmets mechanically important. At the moment, I am approaching this from an abstract pov, so as to make it as flexible as possible. If the body is divided into three parts (head, torso, lower body) and armor divided into three types (light, medium, heavy) this creates the potential for an AC progression of 9 (no armor) to 0 (heavy armor for all three body parts) where Heavy = -3, Medium = -2 and Light = -1. In addition, the torso and lower body can be divided into parts. Each part can have different styles of armor. Add up the different parts, divide by the number of parts (rounding down) in order to get the AC. For example, a retiarius gladiator is often depicted wearing heavy armor on one arm, but none on either the chest or other arm. Thus -3 +0 +0 = 3; 3/3 = 1. In addition, they are often depicted with a heavy armor helm. Thus, the final AC would be 5. Movement rate = ACx10. This can be modified by the STR bonus. Thus, AC 0 with a 13 STR would allow a movement of 10 ft. If the character is wearing nothing but light armor, the STR bonus can be substituted for the DEX bonus. I must admit that I am thinking of using this set-up in context of the 1 hit = 1 hp experiment I came up with over the weekend. Therefore, the following are directly related to that concept; however, with a little fiddling I can see them applicable to a variable damage system as well. Shields can negate one attack per round; however, the character using the shield cannot attack the creature whose attack was blocked that round. I would also consider making the latter two only available to fighters. A recent post over at A Paladin in Citadel has got me thinking about Chainmail (and thus Weapon vs. AC tables) again. I very much like the system proposed, due to its marvelous simplicity; however, it suffers from the same problem that I ran into in my own attempts to implement a Chainmail-esque combat system. Unlike the alternate d20 system that subsequently became the norm, hit points never outpace damage per round in Chainmail combat. A 9HD creature has the potential to kill 9HD worth of opponents per round. This leads to short, deadly and (most importantly) boring combat. All attacks which score hits do 1-6 points damage unless otherwise noted. On its own, this is not earth-shattering; however, this appears as part of the Alternate Combat System. This got me thinking — what if variable damage was not used if the Chainmail combat rules were in place? Rather than doing d6 hp damage per hit, everyone (unless noted — more on that later) would simply do 1 hp damage per hit. On average I would expect combat to last a little longer. Tactics would prove vital — figuring out how to focus attacks on a single target (and getting the right type of weapon vs. armor to increase the chance for a hit with a Weapon vs. AC table) would be key. Morale would play a much greater role in combat (and might actually help keep combats short). Creatures such as Ogres, Giants and Dragons would be truly terrifying, because they are capable of doing variable damage per hit. Having a +1 damage on anything would be a huge bonus. And most importantly, hit points outpace damage beginning at first level. Combat is still deadly, but no one is going to die from a single hit unless they have 1 hp (or are stupid enough to take on an Ogre, Giant or Dragon). Today is the feast of Sts. Chrysanthos and Daria the Martyrs. Chrysanthos was the son of a senator of Alexandria in Egypt. When he became a Christian, this upset his pagan father who had Chrysanthos thrown in jail, hoping that his son would change his disposition. When it became obvious that his plan wasn't going to work, the father summoned a beautiful, educated and pagan woman from Athens — Daria. She was wedded to Chrysanthos in the hopes that through his love for her, Chrysanthos would abandon his faith. This plan also backfired. Through her husband, Daria also became a Christian. They were martyred in 283 when they were buried in what is nicely called "mire," but I'm guessing that a more scientific description might include the word feces. Recently Beedo of Dreams in the Lich House posted the results of some of his polls. Among these was the question "Do you use love in your D&D games?" Of note, Random harlot chart, page 192 1E DMG garnered the most votes (I guess if D&D players were in charge, Chrysanthus would have disappeared into history instead of being remembered as a saint). Personally, this has been an aspect of the game I was never much interested in, nor very comfortable with. In Beedo's poll, I voted for We explore dungeons, not characters because, in terms of relationships, I have always been much more entertained by the camaraderie between PCs and the development of henchmen NPCs. This is where I must begin my however. My current group of players is interested in these kinds of things, though they fall more into the second-most voted for category in Beedo's poll: Characters have gotten married. In our play, no one has gotten married, but given an opportunity (retirement, end-game, etc.) I am fairly certain such an event will happen. Unwittingly, I have also forced the issue a little bit by requiring all Clerics to make their decision to be either married or celibate prior to ordination (so far, surprisingly, celibacy has been the favored choice). Why do bugbears have a surprise of 3 in 6? Because they have eight eyes, of course! Yep, those are the "goons" from Disney's Sleeping Beauty. I don't know what it is, but whenever I watch this classic with my kids, every time I see these guys run across the screen, I am transported back to my very first experiences with D&D and my attempts at making heads or tails out of the Holmes edition. In short, these guys make me want to play. I can't say that about pig-faced orcs, green-faced orks that cry "Waaagh!" or (especially) Pete Jackson's full body-suit orcs. 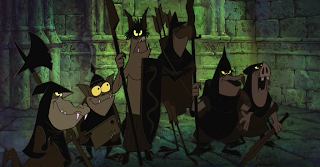 The inspiring thing about the Sleeping Beauty orcs is their deliciously deviant diversity. Yes, the guys are kinda cute, but there is a dangerousness about them that I just can't get enough of. They can be manufactured by either evil magic-users, powerful half-orc champions or any other number of likely candidates for general of an orc army. There is an evil that wanders across my world called the Blight Demon. It feeds off of negative emotions — anger, greed, gluttony, etc. One of the byproducts of a "feeding" is the creation of Blight Spawn. These include such oddities as owlbears, perytons and orcs. The Blight Demon allows the sin of its victims to become physically manifest. This is one of the reasons for the wide diversity among orcs. Finally, through repeated debauchery and heinous behavior, people can slowly transform over time into orcs. In other words, these are true monsters. 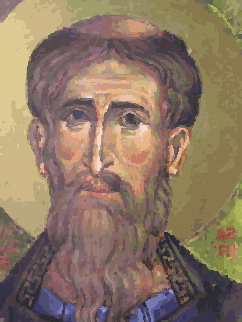 St. Theophanes the Confessor was an 8th-9th century monk who had once been married and been an imperial bodyguard. He died on the island of Samothrace. The title Confessor is given to saints who are imprisoned, tortured and/or sent into exile for the faith but are not martyred. St. Theophanes earned this title because he was exiled to Samothrace by the emperor Leo the Armenian. The issue that caused this exile might seem trivial and strange — icons. 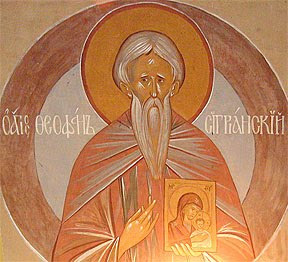 St. Theophanes was one of the defenders of the use of iconography by the Church. Leo the Armenian was an iconoclast (literally, a breaker of the icons). It is kind of amazing to think that a piece of wood with a painting on it could cause a bloody conflict that would last from 730 to 843. The reason that iconoclasm became such a large controversy was because it became an issue over the nature of Christ. The iconoclasts not only argued that icons were idols and therefore banned according to the 10 commandments, but that mere wood and paint were not worthy of depicting the beauty, holiness and glory of Christ and His saints. The iconodules (literally, lovers of icons) argued that if creation, in the form of wood and paint, were evil enough that they were incapable of depicting Christ and His saints, then it follows that iconoclasm calls into question the incarnation of Christ. By refusing the ability of Christians to depict the reality of God Incarnate who walked the earth, interacted with His creation, ate, drank and was touched, heard, and seen because wood and paint are not worthy of His image, they imply that the humanity — which is as much part of creation as wood and paint — is also not worthy of being united with Christ. If we cannot depict Christ, we cannot definitively defend the incarnation. Truly, truly, I say to you, you will see heaven opened, and the angels of God ascending and descending upon the Son of man. Truly, truly I say to you: you will see heaven — the one that has opened — and the angels of God — the ones ascending and descending upon the Son of Man. Note the subtle difference in tense. Nathaniel cannot see what already is, but with faith he will. For Orthodox Christians, icons are one of the means by which we see what already is. 1-3 Myrrh flowing. These icons will produce a flow of myrrh. When used to anoint the wounded, this myrrh will function in the same manner as a staff of healing. 4-6 Protection. These icons produce the effect of a Protection from Evil 10r. spell. 7-9 Healing. Once per day, these icons can produce the effect of a Cure Disease spell. 10-11 Prophesying. These icons will prophesy for the faithful. Once per day they can be asked a yes or no question with the same results as if an Augury spell had been cast. 12 Spell Casting. These icons will allow the user to cast Cleric spells. These spells are determined randomly: 1d3 spells per day. Each spell will be of 1d3 levels. . . .many fantasy gamers see nothing wrong with a game-universe ruled by evil forces, or by a callous "Neutrality" barely distinguishable from evil, but let anyone suggest having an omnipotent good power, and they'll scream, "Blasphemy! That spoils GAME BALANCE!!!! Is it my thesis that a D&D Campaign can assume the existence of an omnipotent God — in fact, the God of the Bible — without losing the quality of suspense, just as, in reality, the existence of that same God does not make life predictable or unchallenging on our "Prime Material Plane." For those of you who follow this blog, you might mistake the above quote for something that I had written from one of my earlier posts; however, you would be mistaken. Rather, it is from an article that ze bulette of Dungeons and Digressions brought to my attention from the Oct/Nov 1981 issue of Judges Guild's Pegasus Magazine — Monotheism In Fantasy Games by Joseph R. Ravitts. From my perspective, it is a fascinating piece of gaming history because it indicates that the seeds that eventually drove me away from playing D&D for many a year were already planted and bearing fruit in 1981. The fact that Ravitts is having to make many of the same arguments that I have in this blog (that monotheism is not only a legitimate choice in FRPGs, but is well supported by fantasy literature) demonstrates a trend within the hobby that may very well have contributed to that dark and ridiculous association of D&D with Satanism by the likes of Pulling, Schoebelen and Hickman. However, I think the most interesting aspect of this article (and what distinguishes it from my own writing) is that Ravitts feels the need to spend a lot of time arguing for a fantasy world where Jesus Christ is not one of many active deities. Over the course of the last three decades, hobbyists have come to agree with Ravitts; however, the majority chose to rid their games of Christianity rather than pagan gods. Which, of course, is where I come in. I have endeavored to demonstrably find ways in which to go the other direction and play this game with a very strong Christian foundation. A foundation that was, at least in part, present in the early years of the hobby as evidenced by Ravitt's need to argue that Jesus Christ cannot coexist with the likes of Odin, Crom, Set, Cthulhu or Krishna as active deities that directly influence fantasy worlds through granting spells to clerics etc. Jesus Christ had to warn His followers, "In this world you will have tribulation." Sam Gamgee, in The Return of the King had a vision of "light and high beauty forever beyond (Sauron's) reach," but this did not relieve him of the responsibility to fight against the immediate threat to his world. Others will object that the stern moral authority of the Christian God puts too many limits on a character's freedom. But have you considered the restrictiveness of other cosmologies? The Eastern religions view man as the prisoner of Karma; in Greek mythology, gods and men were subject to Fate, and often brought on a predestined doom in the very act of trying to avoid it; and in Norse mythology, everything that a hero achieved or enjoyed was overshadowed by the inevitability of Ragnarok. The Judeo-Christian view, in contrast, dignifies mankind by asserting the our will is truly free, and our free choice is crucial to our eternal destiny (Genesis 4:7, Deuteronmy 30:11-14, Joshua 24:15, Matthew 23:37, James 1:13-14). However, the true gem to be found in this article from the annuls of our hobby is Ravitt's description of his own campaign world. Citing the fact that C.S. Lewis had Aslan/Christ supply Narnia with human beings from earth rather than creating a whole separate human race, he imagines his own version of Middle-Earth where two or three hundred years after the fall of Sauron, God arranges for Christians from our world to be transplanted to Middle-Earth to preach the Gospel to the beings that inhabit it. This has caused me to have a very bad case of Gamer ADD because this has put an extremely cool twist on my proposed version of Greyhawk. Rather than use one of my Aslan-esque Christ analogues, I could actually use Christianity with the understanding that St. Cuthbert is one of those Christians brought from our world to preach the Gospel to the World of Greyhawk. Thus, whenever someone says, "That is St. Cuthbert's Church" it is understood that it is the place where you go to worship St. Cuthbert's God — Jesus Christ. It also gives me the freedom to introduce some of the more gonzo elements of the early hobby with impunity. If you have access to Pegasus IV, I recommend reading Monotheism In Fantasy Games, if for nothing else than a fascinating look at the early years of the hobby. 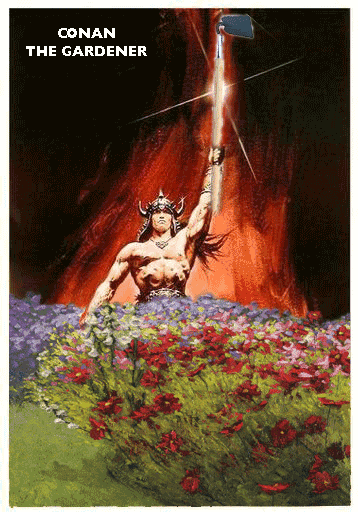 Saintly Saturday: Conan the Gardener! Well, not really; however the name is close enough (Konon/Κόνων) that I just couldn't resist. What does the governor need of me, since I am a Christian? Let him call those who think the way he does and have the same religion with him. He was martyred when he refused to sacrifice to the idols. This appears to be a normal soldier's spade and may be used as either a digging tool or a weapon; however, its miraculous character does not become apparent until someone with a STR of 8 or less attempts to use it to turn the earth. For every negative STR penalty that the character has using the spade, it will produce enough food to feed one person for one day (STR 3 = 3 people; 4-5= 2 people 6-8 = 1 person). This power is usable once per day. Recently, James posed one of his Friday Questions on envy. He was specifically interested in game systems and the communities that exist around them. Upon serious reflection, I am not that much envious of any group of gamers (indeed, via the blogosphere I get to be apart of a very special group of people). Rather, I grew up envious of those who had a love for J.R.R. Tolkien and his works. Growing up, I was one of those slow readers who just didn't comprehend what I was reading until well into 3rd or 4th grade. By that time, I was already playing D&D. Since I wasn't able to understand what I was reading, I gave my Holmes edition to my best friend to read and he taught me. The main influence in his understanding of fantasy was Tolkien. By the time we started to play on a regular basis, he had read the whole of the Lord of the Rings three or four times. His efforts on world-building focused on a Middle-Earth-inspired continent he called Karafax (if I remember correctly) where the Dwarvish Oakenshield clan played a large role. When reading finally became accessible to me, I found Tolkien beyond me. This frustrated me, exacerbated by disappointment. My grandfather died shortly before D&D entered into my life. The one thing that was bequeathed to me after his death was his boxed copy of Tolkien works. I was assured that my grandfather adored Middle Earth and everything about it. Unable to read it, and having parents who were uninterested in fantasy (at best) meant that I would be denied any kind of pleasure from Tolkien (and thus remembering my grandfather in one of the few things I knew about him) for decades. Thus, I unconsciously rejected Tolkien as a source for my own world-building efforts and concentrated rather on obscure works of Sword & Sorcery in the hopes of finding something as special and as inspiring. As an aside, my own current group had an interesting conversation about demi-humans and our like/dislike for them. Elves are surprisingy despised and gnomes are very popular. I had to admit my own bias towards half-orcs, which stems from my affection for Garth the Overman from Lawrence Watt-Evans' The Seven Altars of Dûsarra. D&D has no overmen, but half-orcs have always proved to be a good substitute. Recently, however, I have been re-examining my own relationship with Mr. Tolkien and his writing. Part of this has been doing something for my kids that I was denied when I was their age: everyday after school we sit together and I read aloud a little bit of The Hobbit. I have been pleasantly surprised how good it is, and am reminded by how large it looms in my own imagining of what D&D looks like. Tolkien himself was often moved by scenes he wrote displaying his characters’ “physical resistance to evil,” reverently calling their actions nothing less than “a major act of loyalty to God.” This loyalty, equal parts physical and spiritual, was in turn something that he believed “only becomes a virtue when one is under pressure to desert it.” The world of The Lord of the Rings is filled with great temptations of a sort that don’t lead directly to evil per se, but that lead to the abandonment of the physical resistance — the pain, the suffering — that Tolkien considered so central to his notions of true heroism. Given James' recent hypothesis "You are What You Read or See" I have to admit that though I tried to abandon Tolkien all those decades ago, he has had a profound influence upon me and the way I play the game. Though I have played D&D since the 70s, I have only seen three of my characters get to 7th level or beyond. Personally, I love playing low-level (and low-life) characters. I love playing the role of that nobody (even reviled outsider — read half-orc) who is nonetheless willing to physically resist evil and make a difference, no matter how small. This has always had a far more powerful pull on me than the end-game of D&D with its high levels and castle-building ever did.